meeting rooms, classrooms and even outdoors like camping. ●Standard black backing to avoid light penetration. ●It with portable and adjustable heavy-duty tripod stand. ●1.1 gain multilayer matte white material screen with perfect light diffusion uniformity. ●Lightweight with scratch resistant metal white case withstands the rigors of transportation. ●Four side black borders enhance picture contrast and absorb light overshoot for an optimum image. where there is lack of space and no drilling on wall for mounting. ●Viewing Area (W x H): 70" x 70"
【Easy Take & Easy Carry】Compact one-piece, the projector screen can be folded in small size and put in backpack or suitcase. Designed with foldable stand tripod, the screen is more stable and convenient to store, take and carry. 【High Quality Material】Unlike other screens, the projection screen is made up of wrinkle-free PVC fabric materials, which is mildew resistant and anti-static. The anti-acid fabric screen prevents dust accumulation, and it is easy to clean with mild soap and water. 【Easy Installation & Huge Enjoy】No need for any screws, the projector screen is designed for easy setup and fast take down. Besides, the diagonal 1:1 presentation screen is 100 inch with over 160 degree wide viewing angle, creating a feast of view for you. 【Adjustable Height & Various Application】With auto-locking mechanism, the screen owns a wide range of height settings and the stand can be adjusted from 1.7-2.19 m/66.93-86.22 in (from screen top to floor). Compatible with all projectors (4K, DLP, CRT, LCD, HD, 3D), ideal for all occasions needing projector screen. 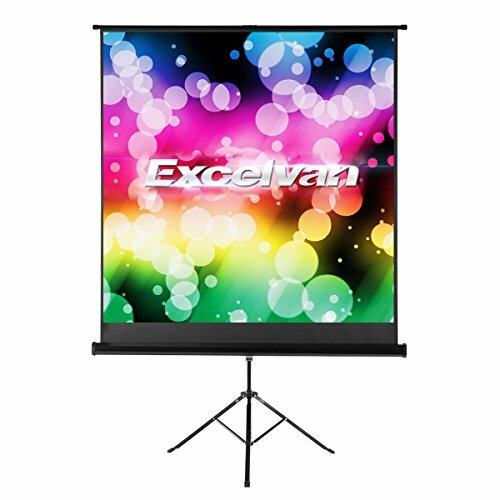 【Sincere Service & 100% Satisfaction】All Excelvan projector screens have 1 year warranty, 100% satisfaction and zero hassle returns guaranteed. Any doubt or assistance, contact us freely.